Debby Haase describes the annual winter solstice ceremony called “Spiral of Light” which commemorates the longest night of the year with candlelight, harp music, chanting and labyrinths. This annual event has been held at various island locations, such as the Bodhi Center, but will take place this year at the Dayaalu Center at 159 Wyatt Way in Winslow, from 7pm to 9pm on the winter solstice night of Wednesday December 21st. Doors open at 6:45pm. In this podcast, Debby explains to BCB’s Channie Peters that the commemoration of the winter solstice night dates back many millennia. This modern version of the ceremony, with spirals, was developed at various Waldorf schools in the past century. Debby herself was formerly a teacher at the Madrona School on Bainbridge, which offers a creative curriculum inspired by the Waldorf education model. The event this year is facilitated by Debby and by Kathryn LaFond, with special guest Judy Friesem playing the harp. 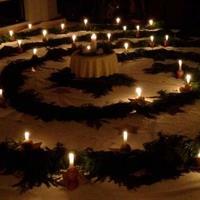 Participants will carry candles around labyrinth-like spirals, accompanied by the sounds of toning, chanting and song. This ceremony for 2016 is likely to be an uplifting antidote to the stresses and anguish of a distressing year in the national news. The suggested donation is $15. You may either register in advance at the Dayaalu website, or simply come early at 6:45 and pay at the door.